Bring your banners, signs, blue glowsticks, flyers– demand for human rights! This year, International Human Rights Day comes at a time when a national movement for economic equality and fairness is spreading across the US. As people from all walks of life in the US unite against corporate greed, let us also remember the millions of civilians around the world whose lives have been taken by US military and counter-insurgency operations throughout history such as Operation Condor in South America, Operation Brother Sam in Brazil, Operation Phoenix in Vietnam, Operation Enduring Freedom in the Philippines and countless other covert CIA operations in Latin America, Africa, Asia, Europe, and the Middle East. Under Obama, war, militarism and counter-insurgency continue to be an integral part of US foreign policy to ensure the protection and advancement of the US corporate minority’s interests worldwide. Here in the belly of the beast, we see the effects of this minority interest through the siphoning of public funds for war, militarism, and counter-insurgency, instead of investing in jobs, our education, housing, healthcare and our other basic human needs. At the same time, the state answers growing public outcry and resistance with intensifying political repression and the denial of civil rights. Human rights encompass ALL facets of rights which shall remain inalienable according to the United Nation’s Universal Declaration of Human Rights. We are calling on all those who firmly believe in human rights to commemorate International Human Rights Day on December 10, 2011. Join us as we fill the streets with flowing candlelight in honor of all those who have fought for their rights. Call for justice for those taken victim to human rights violations. Lights for Rights NYC aims to unite all those who stand for equal civil, political, economic, social and cultural rights of all people, not just for the privileged. 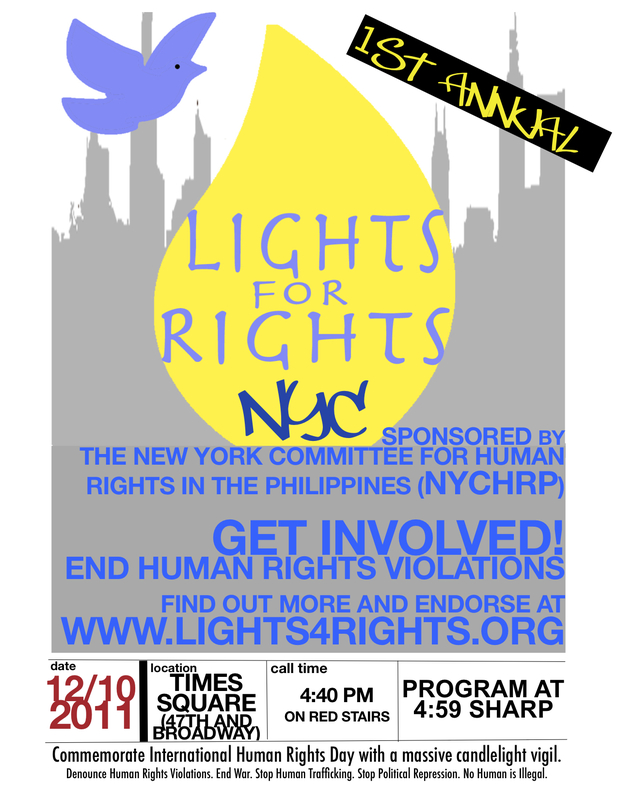 New York Committee for Human Rights in the Philippines (NYCHRP) is a NYC-based grassroots community organization that shares the vision of human rights advanced by the growing mass movement for social justice in the Philippines. NYCHRP engages in advocacy work to educate, organize and mobilize Filipinos and solidarity allies to take progressive action in upholding and supporting human rights of Filipinos and all people throughout the world. To endorse the Lights for Rights (individual leader or organization), go to www.LIGHTS4RIGHTS.org. To become an individual or organizational member of Lights for Rights, send an e-mail to: ytliriano@gmail.com.